Here's Kings Jester Charlie (from Whiff of Joy) again...this time in rich colors of oranges and blues to match the yummy Marakesh paper I was itching to use! I just adore this Charlie image...one of my favorite Charlies yet for sure!! I made this card for the Papertake Weekly challenge today...a recipe challenge...1 circle, 2 ribbons, and 3 stamps. The circle is a Technique Tuesday tile covered with pp and then inked with chalk ink. The stamps besides Charlie are a sentiment from Party sentiments (WOJ) and swirls from Lizzie Anne Designs. All images were colored/highlighted with my copics, then I added a bit of gold glitter with my gold spica pen. Today is Michael's 6th birthday...I can't believe my baby is 6 already! He starts off the birthdays for the kids...before too long the others will be 13, 14 and 16! Yikes! I feel oooold. so today though we are heading to daddy's restaurant for a birthday brownie, to Cici's for dinner (his favorite is spinach pizza...and yes, all my kids love spinach pizza! Go figure....oh, and then maybe to see Monsters vs Aliens. should be a fun, yet rainy day. So, first up is a bright one for you...this is my card for last Saturdays (oops) Our Creative Corner Challenge. I used the adorable little chick from the Spring Whiff of Joy kit. I stamped and colored him in twice then cut him out and stacked them up. The shadow underneath is the smallest AMuse oval that I have...and the saying is by Verve. Pretty simple card, but I think it turned out really cute on the white background! And for the other card that I gave you a quickie peek of...this is for Wednesdays Whiff of Joy challenge blog...another sketch challenge. I used Willow with Flowers (which was also a part of the Spring kit but is now available sold separately) and General Sayings. I am still trying out the Neenah cs. It really soaks up the color, and its easier to layer and blend, but it runs a bit under the lines for my taste. The flower I'm still not totally happy with, but it turned out kinda neat. I couldn't find the right color purple or pink and started to dye a white one, then I thought to use stickles instead. Its definitely prettier in person. Good morning! I am going to try to get back on track with morning posts instead of evenings, that also gives me a chance to get them ready the night before..I was really good at this at one point, LOL, but when I lost wireless forever I couldn't sit in bed at night blogging. This was an awesome card to make...it helps to start with a sketch from Katharina...she always gives them great twists! This sketch is for the Cute Card Thursday challenge this week. I used Maid Charlotte, from the Whiff of Joy Medieval Collection. You may have noticed, I found my Fairy Useful sayings...I had to clean my desk, but hey, too birds with one stone! Meet the Chickie Hop chicks from Stampendous...are they adorable or what? These came in new at work and I wanted to make some samples for the store. Next up...thats right, I have 2 for you tonight!! This is King's Jester Charlie, from the Medieval Collection by Whiff of Joy. He was really fun to color, with all the pleats and juggling balls and bells. The bells are colored with a silver sharpie. I am once again quickly typing, as Perry is on his way to class in a minute. And, Still no computer. WHINE!!! This is Willow with Sunhat, another image from the Spring Kit at Whiff of Joy...now available for those of you who missed the kit as separate stamps! I used the sketch this week at Papercraft Planet for the layout of the card. The sentiment is another Amy R Stamps images. The only new stamps that I have bought recently are a TON of Whiff of Joy images...so guess what you will be seeing all week?! The Spring Kit arrived last week, shortly followed by my Medeival Collection images. The pattern paper is all Basic Grey, Mellow collection...as are the buttons. I pulled out my Copic Airbrush system for the first time in a while, it definately helped to tone down the white, but I still want more practice with it. All the panels are sewn with a taupe thread, and that yummy skinny rust ribbon is by Martha Stewart. The sentiment stamp is from Lizzie Anne designs. Here is a card I made for a challenge about 2 weeks ago...just before my hard drive crashed, so I never posted it...but now I have no clue what it was originally for, sorry! This is Melinda Reading Book, also a Whiff of Joy image,( although one of my older ones, but still a fav) from the Guardian Angel collection. She is paired with some fun paper my friend Heather bought me, and some fun hardware from my stash. The sentiment is an Amy R Stamps image( available at All That Scraps). I have 2 cards for you this morning...another for the Whiff of Joy challenge from last week, and todays Unity addicts challenge. I loved Katharina's sketch last week and wanted to make another card with it before it got lost on my desk :) I started this one days ago, but it still needed something...so a couple of extra layers and doodads this morning and its ready! The adorable donkey is one of the Party Animals line from Whiff of Joy, this is Michelle celebrating Donkey. She is just so happy! I cut the bg layer from MaMBI pattern paper using a Technique Tuesday tile for the pattern...tracing and then cut out. The main panel and layers are all done with my circle nestabilites. Michelle is colored in with copics, then highlighted with my spica glitter pens. And here is my card for the UNity addicts challenge. I am not totally happy with it...a bit too simple. But the challenge was to use red, pink, blue, and yellow and a theme of Valentine's day. Yellow is always hard for me, so I chose a pp I like from my Urban Prairie Basic Grey pad...lots of yellow and pink and blue. I added some Rose Red mats for the red...even though it looks more pink I think, its not cheating if the name contains red, right??! Check to the right of my sidebar for the list of other Unity addicts and go look for more eye candy there! I have been swamped lately with needing birthday cards...mainly for my kids' friends it seems. So I am sooo glad that got a few of these adorable Party Animals from Whiff of Joy! This is Henry Celebrating Mouse, again...I think he may be my fav of this line. No shimmerz on him this time, just a tad of spica glitter pens over the copic marker coloring. Half of the base of the card is cuttlebugged with the Happy Birthday folder. The pp is bits of a Junkitz line that was in my scrap basket. Layout is last weeks sketch from PCP. The sentiment is also Whiff of Joy, Party setiments. Katharina, owner of Whiff of Joy, presented a sketch chalenge on her blog HERE, and the winner receives a new Party animal stamp from Whiff of Joy. Well, everyone knows I can't resist a good challenge, especially when there are FREE stamps involoved! And that little mouse under the party hat is a gotta have too:) Have you seen all the new adorable images drawn by alison?? Too cute!! Here's a closeup of the ribbon treatment. I sewed the Soft Sky ribbon onto the chocolate cs corner piece, adding some ruffles for interest. I think it turned out really neat!! I didn't want too much going on, so I didnt put the ribbon on the other corner piece, just a tag instead, keeping it asymmetrical yet still centered, KWIM? And here's the other corner...the sentiment is from a Verve Stamps set, Starlight, Starbright remixed. I thought this would be another great baby card! So, thats the main ingrediants of the card...I also added some Glaze to the eyes and nose of each snowman, and to the berries, some highlights with a white gel pen, and some dew drops. Guess What?? Whiff of Joy is having their first NEW RELEASE party over at the WoJ group on Papercraft Planet this afternoon (5pm EST)! Cool! I hate I will miss most of it :( But Katharina also having a sketch challnge for a chance to win some of the new releases!! Its a new birthday line by Alison Acton...and those Party animals are super-cute!!! But, on to the cards!! I have a couple of challenge cards for you this afternoon! First up...the last challenge on the Whiff of Joy challenge blog for December was good for the whole month (thanks goodness). The challenge was to do a Christmas card in non-traditional colors (no red or green). So, here is what I came up with last week. This is Charlotte with Reindeer from Whiff of Joy. She is one of the first stamps I ever ordered from Katharina and ...still one of my favorites! I chose to pair her with some old pp from my stash is Pinks and Turquoise. I think the layout was also a sketch challenge from somewhere a couple of weeks back, but now I don't remember! And another for you...this is Charlotte and cat, also from Whiff of Joy. I played along with a sketch challenge from Papertake Weekly...this is Dawny's sketch #5. I used some colors out of my comfort zone....but wanted to use some of my Eva paper by Basic Grey. I think the flowers turned out a bit bright...whaddaya think?? This is last weeks sketch challenge by Heather over at the Whiff of Joy Challenge blog. I used the WoJ image "Willow with Umbrella"for the main panel. She is colored with my copics to match the pp I chose...some Urban Prairie from Basic Grey. I kept the card really simple, or nothing would get finished this time of year, KWIM? Also used Circle nesties by Spellbinders, chocolate ribbon from CTMH, and some My Minds Eye buttons. Once again, I have waited until the absolute very latest minute...Whiff of Joy had the last Guest DT call due today...and I may have even gotten the time zone conversion messed up?? WHo knows. Even if, I love how the page ended up so, whatever!!! Here's the page... The call for the Guest DT spot is over at Paper Craft Planet...just joined today, so come find me! So...I used Katharina's setch for the challenge and decided to do a page instead of a card. I have been really bad about not scrapping as much lately...and here is an early resolution...I WILL scrap more this year!! Here's the first closeup of the page. 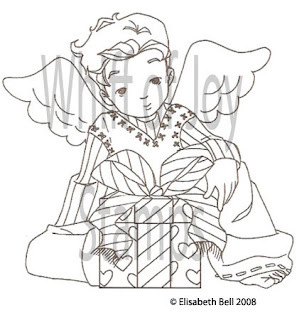 I stamped 2 Guardian Angels for the layout...Melinda blowing kisses and Matthew with presents (both are Whiff of Joy). I added some swirls from the SU! set Season of Joy. The large tile is actually one of many in a package from Technique Tuesday. I inked it directly with a cats eye chalk pad, then stamped over that with Palette ink with the same swirl. All images were colored with copics, then I added Buttercream Shimmerz to the wings of both angels and the hearts. On this closeup you can really see the tile, as well as some of the many buttons I added, the scalloped edge on the PP and the bg paper...it was traced with a larger tile from the same pack then I cut it out and inked the edges. Happy Halloween! I hate to admit it, but I am kind of sick of the Halloween cards and treats :( So I did a couple of Christmas Challenges for today instead! The first card is for the Whiff of Joy Challnge blog...this weeks challenge was to use red and green. I pulled out Whiff of JoyCharlotte riding her adorable reindeer which I haven't stamped in a while and made her all nice and sparkly! I used some of the 6x6 Figgy paper from Basic Grey that I still have from last year and paired it with Riding Hood Red and Always Artichoke...not really bright enough for me...but I have to get out of my box some. The poinsettia flowers are by Making Memories, and I added some stickles to them and to the brads in their centers....as well as to the brad that I added to my ribbon and Charlotte's earmuffs :) I got to use some of my Spellbinders dies again...the double end tag and my brackets that shamefully had never been out of the package :( The sentiment is from one of Amy R Stampsnewest sets...Christmas Sentiments. The greeting is actually one that is meant for the inside...thus the name of the set...Christmas Card verses, but I wanted something bigger for this card so I put it on the front. And let me tell you...this is THE set you have ALWAYS wanted! How many times have you looked for the right sentiment for the inside when addressing and filling out Christmas cards? Forever! But no longer! The set is here and it rocks!! Click HEREto see the sets. AND they are on sale today!! I colored Charlie in with my copics...then stamped him again...cutting out just Charlie and raising him up and then the present again and raised it up some more...the paper toleing technique. Looks like he's really sitting ON the bag! The cs is then distresseda lot with Desert Sand ink to make it work with the PP...it wasn't really white or cream to begin with. The sentiment I cut out with my brand-spankin new Spellbinders tag die!! LOVE THEM!! Since I had such a crazy week last week I never got around to challenge #3...so I decided to hit both at once this week :) This is last weeks sketch from the WoJ Challenge blog and this weeks challenge: to use Autumn colors. I am soooo behind this week and its not going to get better until the big scrapbook day is behind me next Saturday! Aaaggggh! So, quick post...this card is for 2 challenges...this weeks Whiff of Joy challenge (stitching) and ABC Challenge blog... a sketch by Katharina. I used Charlie and Snowman...one of the first WoJ releases...did you know that the NEW ones are being released tonight?!! Can't wait! Head to Whiff of Joyto check them out! Isn't she just gorgeous? These images are so fun to color...I have really enjoyed practicing my copic techniques with these guys! The stitching around all the layers is in a khaki color...I thought white or dark brown might get lost? Its actually about the color of the Sahara Sand that I used as the shadow that Willow is sitting on (A Muse oval). I have also been trying to pull out more of the kazillion flowers that I have been collecting...these brown beauties are Fancy Pants. I also added some flourishes to the corners of the main panel and the sentiment tag, but its really pale and hard to see on the screen. WOW!! It has been a busy morning for posts for me...sorry! This is the last post for now I think! But I had 3 things that needed to go up all today! This is my card entry for the Whiff of JoyGuest designer challenge :) You can see the details on the challenge at Katharina's blog ---->HERE. I didn't spot this until about a week ago...knee deep in design work so of course I put this off til the last minute...what was I thinking?? But, hellooooo...last minute is just me!! I do have to admit that I really enjoyed making this card today...everything else was all caught up for a minute so I could breathe! (Then its off to 2 release parties today!!) I wa s supposed to use any of Katharina's sketches for the card...so I chose the sketch that is for the very first challenge on the NEW Whiff of Joy Challenge blog! So this is also my entry for that challenge..is that double dipping? Hope not...I call it time management! So, for my card I used one of the new Guardian Angel stamps...Melinda Reading Book. (I also have to share for my North American friends...that Christine at All That Scrapsis carrying these images in her store so shipping won't be quite as long...but she is out of stock of many...they are quite popular!) My original order from Switzerland was actually very fast...just at a week or so! I colored Melinda in with my copics...adding a bit of glitter to her charm, necklace, and of course her hair with a gold glitter pen. I also pulled out one of my new Shimmerz paints to add to her wings...they are so shimmery!! The book is paper-pieced with the same Basic Greay papers that I used for the background pieces. Then sentiment is from Verve...I bent it around in a bit of a circle since its an acrylic stamp its not too hard to do. OK, so don't fpget to check out the new Whiff of Joy challenge blog...and to head over to the Whiff of Joy siteto see all the beautiful Guardian Angels, Oakley and Willows, and Charlotte and Charlies! (I would send you to enter the GD contest...but time is up in just 20 minutes or so!...but the link is above in the post if you do want to chack out all the entries) Thanks for stopping by! I went to Papertake Weekly...no new sketch this week..but there was a challenge to make a yellow card to mail in for making the biggest card ever...see the details and about the BBC Children in Need card HERE. This is Melinda blowing Kisses...she is sweet beyond words. I really enjoyed coloring her...I have been practicing my copic technique and I think its getting better! Thats it for tonight...I will have another post first thing Wed am for you so check back...and don't forget to say hi!! Thanks for visiting! I love Whiff of Joy!! ETA: I am so sorry Katharina...Whiff of Joyis based in Switzerland, not Sweden...I knew that...just a brain lapse...call it old age?? Even my 12yr old DD who read the post said..."aren't these the stamps from Switzerland?" I just rolled my eyes. I woke to such a happy suprise today...Katharina of Creative Ideas by Katharina has 2 of my cards featured on her blog for YAOB Sunday!! How cool is that?! She is the owner of Whiff of Joy...a new Swedish company that I was bragging about a few weeks back...the images are simply amazing! The first line...Charlotte and Charlie are fun, whimsical, and simply adorable! The NEW line of Guardian Angel stamps and Oakley and Willow are breathtakingly beautiful...and I just got my new order in yesterday!!! I then cut them out with my Oval Nestabilites and added a bit of jazz and voila...a non-traditional-Christmas-colors Christmas card! Next I used Charlie with his snowballs again for this card. It is based on a sketch from the Friday Sketchers blog...sketch is #19 last week by Heidi from Norway. I got to pull out some of my fun new goodies from the Stampin' Up! Holiday mini for this one...these felt snowflakes are just yummy!! This image just makes me want to squeel!!! In fact when my envelope arrived from Switzerland this week I did squeel...I went running from the mailbox to open it....my new Whiff of Joy stamps!! They are sooooo cute! I couldn't wait to get them all inky, but that just didn't happen this week...kids getting ready to go back to school seems to have overtaken my life. So finally this weekend I pulled out the first one which was Winter Charlotte and cat. You KNOW how I love all my kitties so this was the first to go into my cart, get mounted, and get inked! I used Jen del Muro's SFYTT from about 2 weeks ago...the format was just right for one of these large images. I also pulled out some old paper that wasn;t getting any love and a couple of last year's SU! Christmas sets. The sentiment is Elzybells, and the oval is A Muse. I added just a touch of sparkle to her eyes and jacket with a Gelly Roll stardust glitter pen.